A masterful psychological suspense debut about the disappearances of two young women—a decade apart—told in reverse. 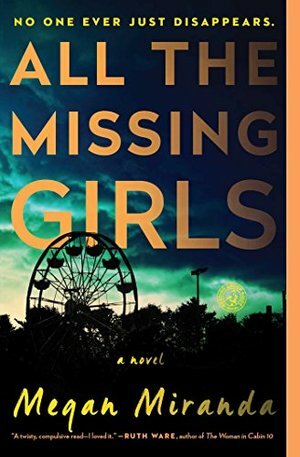 “All the Missing Girls is set to become one of the best books of 2016” (Los Angeles Review of Books).Twenty-eight-year-old Nicolette Farrell returns to Cooley Ridge, North Carolina, ten years after her best friend Corinne disappeared without a trace. Nic plans to tie up loose ends and care for her ailing father, but she is soon plunged into a new drama that reawakens Corinne’s case and breaks open old wounds that have not healed. The decade-old investigation focused on Nic, her brother Daniel, boyfriend Tyler, and Corinne’s boyfriend Jackson. Since, only Nic has left Cooley Ridge. Daniel and his wife, Laura, are expecting a baby; Jackson works at the town bar; and Tyler is dating Annaleise Carter, Nic’s younger neighbor. Then, within days of Nic’s return, Annaleise goes missing. Hailed “Hitchcockian” by The New York Times Book Review, All the Missing Girls is told backwards—from the time Annaleise goes missing prompting Nic to unravel the truth about what really happened to Corinne that night ten years ago. With plenty of twists and turns that lead down dark alleys and dead ends, Megan Miranda turns it all upside down and inside out and leaves you wondering just how far you might go to protect those you love. I liked this book, but did not loved how it was written. The story is told backwards from Day 15 to Day 1. It was kind of confusing at first. I like the concept of telling a story backwards, but just not with this plot. I did finish the book and enjoy it. I might have enjoyed it more if it was written a different way. The plot is about a girl who leaves home, but then has to come back 10 years later for the summer to help take care of her ailing father. You learn that the reason she left was because one of her friends goes missing, and she along with her then boyfriend and brother are all being questioned. The night she returns home, another former friend disappears. She and her family are again question in her disappearance, and you later learn exactly what happened on that night 10 years ago. Little difficult to follow. Too many, "the day before" pages.